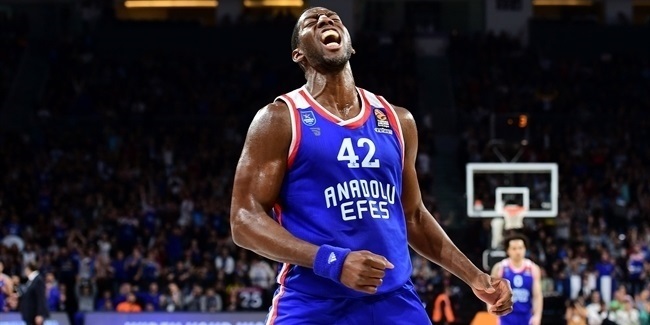 For the second straight week, Anadolu Efes Istanbul forward Derrick Brown put on a stellar performance to lead his team to an important win. 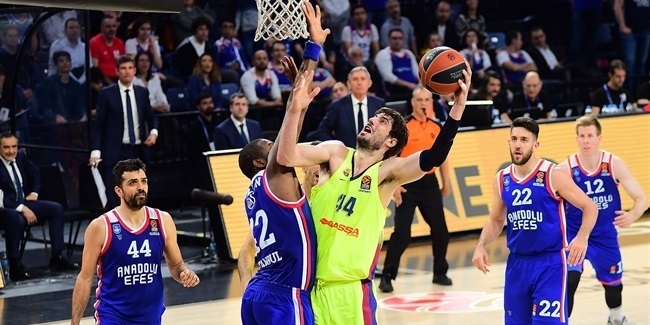 And this time he also recorded the highest performance index rating among all Turkish Airlines EuroLeague players to claim the MVP honor for Round 10 of the regular season. Brown shined with 22 points, 12 rebounds, 3 assists and 2 steals in a 77-86 road win by Efes over Maccabi FOX Tel Aviv. He also drew 7 fouls in amassing a performance index rating of 38, the same as he had a week ago in finishing second among MVP candidates for that round. 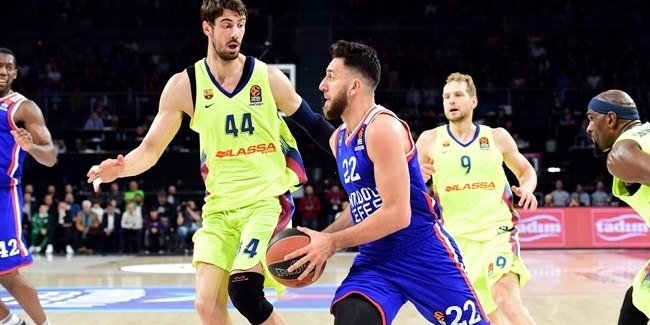 Behind Brown this week, Nicolo Melli of Brose Bamberg tied his career highs with 26 points and a performance index rating of 37, but his team lost at the buzzer to CSKA Moscow, 88-90. Melli missed only 2 shots from the court and 1 from the foul line in an impressive outing that also included 5 rebounds and 3 blocks. Another Efes player was among Round 10's stars: Tyler Honeycutt posted 21 points, 8 boards, 5 assists, 3 steals and 1 block for an index rating of 31 in Tel Aviv. Completing the list of Round 10's best were Keith Langford of Unics Kazan and Milos Teodosic of CSKA Moscow. Langford led his team to a 100-79 rout of EA7 Emporio Armani Milan with 25 points, 4 assists and an index rating of 29. Teodosic, the Round 9 MVP, posted 31 points and 8 assists, including the one that led to a game-winning buzzer-beater, for an index rating of 26 in his team's road victory over Bamberg. Teodosic was the top scorer in the competition for the second straight round. He netted 31 points in Bamberg and is now fourth in the league in scoring with 18.7 points per game. 2014 Alphonso Ford Top Scorer Trophy winner Langford remains atop the charts with an average of 23.2 points. Teodosic is the top assist man this season with 8.2 per game. However the man with the most assists in Round 10 was Quino Colom of Unics, who dished 12 on Thursday against EA7 Milan. Brown was not only the Round 10 MVP, but also its top rebounder with 12 boards. His teammate Honeycutt leads the league with an average of 8.4 rebounds per game. Charles Jenkins of Crvena Zvezda mts Belgrade had 5 steals, most of any player in Round 10. Jenkins is now tied with Shane Larkin of Baskonia Vitoria Gasteiz for the league lead with 1.8 steals per contest. Tibor Pleiss of Galatasaray Odebank Istanbul led all players with 4 blocks this week. Artsiom Parakhouski of Unics remains as the blocked shots leader after Round 10 with 1.7 per night. Alongside MVP Brown, there were two players with double-doubles in Round 10: Galatasaray's Pleiss posted 16 points plus 11 rebounds, while Ekpe Udoh of Fenerbahce Istanbul collected 14 points and 10 rebounds.